Mesa County Commissioners John Justman and Rose Pugliese present the "State of the County" to the Grand Junction Rotary Club. Mesa County Commissioner Rose Pugliese shares with the club she is excited that the April unemployment rate is down to 3.2 percent. Mesa County Commissioners talk to the Grand Junction Rotary Club about the Grand Valley's economy including, sales tax, unemployment rate, foreclosure filings, building permits and labor force. Mesa County Commissioner John Justman talks to the club about his recent trip to Coos Bay, Oregon, to tour of the Jordan Cove project site. 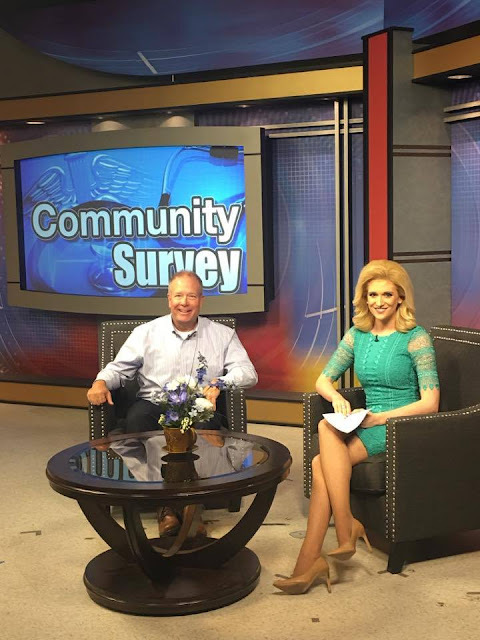 Mesa County Public Health Executive Director Jeff Kuhr interviewed live in the studio with KREX News Channel 5's Lauren Klenda this week. He and Lauren discussed MCPH's community survey. Visit health.mesacounty.us to take the 10-minute survey focused on community connectedness. Make your voice heard! Mesa County Assessor Ken Brownlee discusses with the Inside Mesa County (IMC) class the effects the Gallagher Amendment and Tabor have on property taxes. Mesa County Assessor Ken Brownlee explains to IMC class members that on average residential property taxes will go down for the 2017 tax year. Mesa County Weed and Pest Management staff members Stacey Wilson (left) and Teresa Nees on site at the Mt. 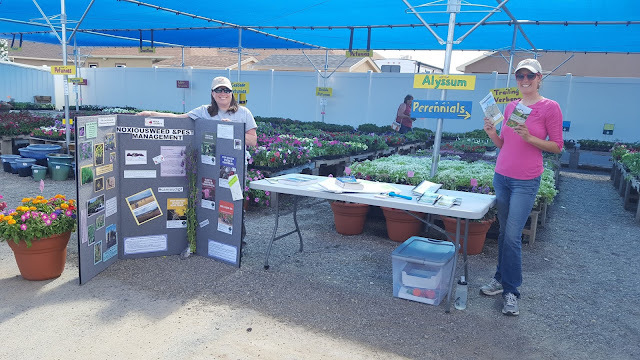 Garfield Greenhouse Nursery promoting the Ornamental Noxious Weed Gift Card Exchange program. Catch their booth on Saturday, June 3, at the CSU Extension Office for the Ute Garden Open House! 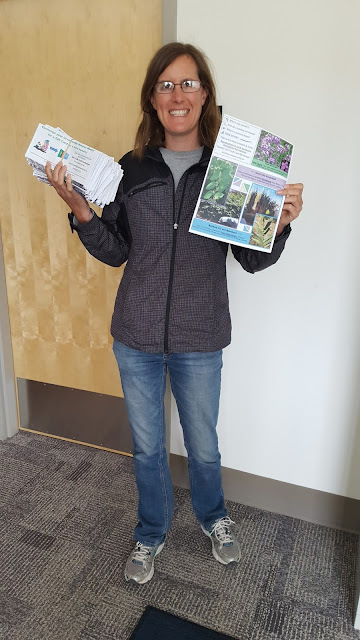 Mesa County Noxious Weed Management Coordinator Teresa Nees sends out flyers describing the Gift Card Exchange Program to residents with ornamental noxious weeds. For more information on how to a get gift card, check your mail or visit https://goo.gl/2jxlxZ! Admission is free! Join them on Saturday, June 3, from 9 a.m. to 2 p.m., behind the CSU Extension Mesa County office, 2775 Hwy 50, for gardening demonstrations and much more. Master Gardeners will have snacks and garden items available for support of their program. Take the family, friends and neighbors for this fun educational event! Got goat heads? Get 'em! 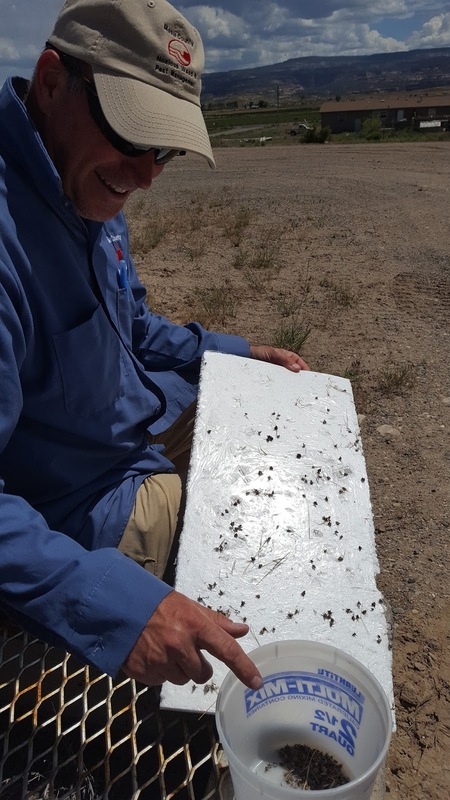 Mesa County Weed and Pest Management staff member Alan Barbee tries an easy method of removing the pokey puncturevine (goat head) seeds from an area. Puncturevine is an annual weed (each plant only lives for one year) that can be easily pulled or dug up throughout the summer. To prevent more weeds from growing and getting flat bicycle tires, the seeds can be picked up with a piece of foam and thrown away! Another way to get rid of goat head thorns — wear soft foam flip-flop sandals. 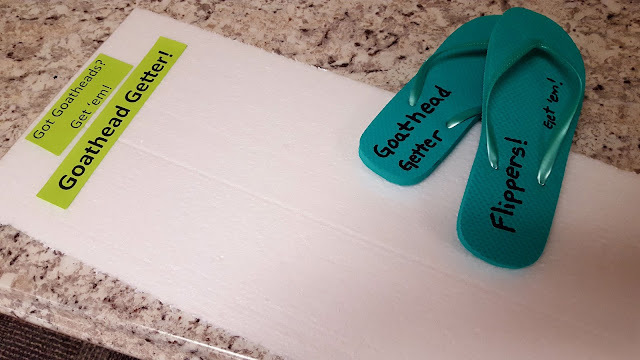 Walk around your backyard, and then carefully pick off the goat heads, and toss them in the garbage. Mesa County Chief Financial Officer Scott Stewart explains the inner working of the finance department to the IMC class, as well as the economic history of the Grand Valley. Class members ask Mesa County Chief Financial Officer Scott Stewart how the Mesa County budget is prepared. Mesa County residents are invited to an open house on Wednesday, June 7, regarding the 31 Road Intersection Improvement Project. The rehabilitation of Animal Services Building continues. Micropiles were placed to support the new floor. Micropile is a type of ground treatment, which acts as a supporting structure to transfer the load from the building to the ground. Crews are hard at work at the Mesa County Animal Services facility, 971 Coffman Road. Pictured here is the exterior excavation of the quarantine isolation area at the Mesa County Animal Services facility. The Healthy Humanitarians (DHS, Public Health & Workforce Center) team up to raise funds for St Baldrick's with a pulled pork luncheon. Mesa County Public Health Executive Director Jeff Kuhr, left, and Mesa County Department of Human Services Director Tracey Garchar serve lunch. 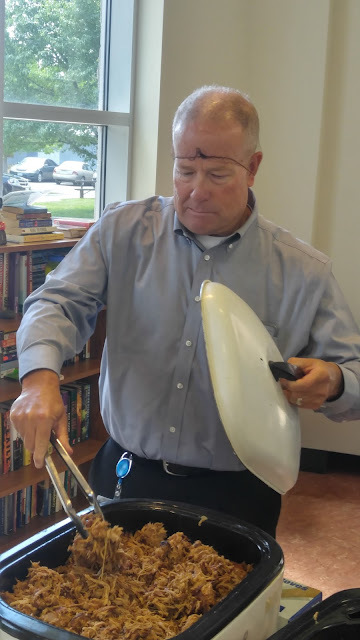 Mesa County Public Health Executive Director Jeff Kuhr always wears a hairnet when serving food! 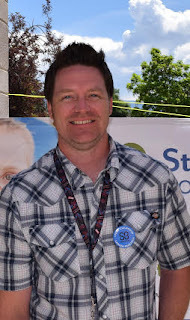 Mesa County Department of Human Services Case Manager Josh Kennedy volunteers to shave his head to help raise funds for St. Baldrick's, a volunteer-powered charity that funds childhood cancer research grants. 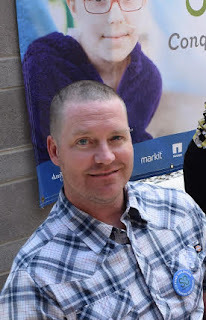 Mesa County Department of Human Services Case Manager Josh Kennedy shaves his head for a good cause! Mesa County Fairgrounds staffers are getting ready for the 2017 Mesa County Fair. Only 51 more days until the fair! Mesa County staff are getting ready for the fair and are busy with dirt work and electrical upgrades. This year the fair will take place July 25-29. For more details, visit mesacountyfair.com. On Thursday, Mesa County Solid Waste Management Director Barrett Jensen hosted an employee appreciation luncheon to thank his staff at the Mesa County Solid Waste Campus shop, 3071 Highway 50. The Mesa County landfill recently underwent a change in management and operational structure to reduce costs. Mesa County Solid Waste Operations Manager (and cake maestro) Amber Swasey made a chocolate landfill inspired cake for the employee appreciation luncheon. 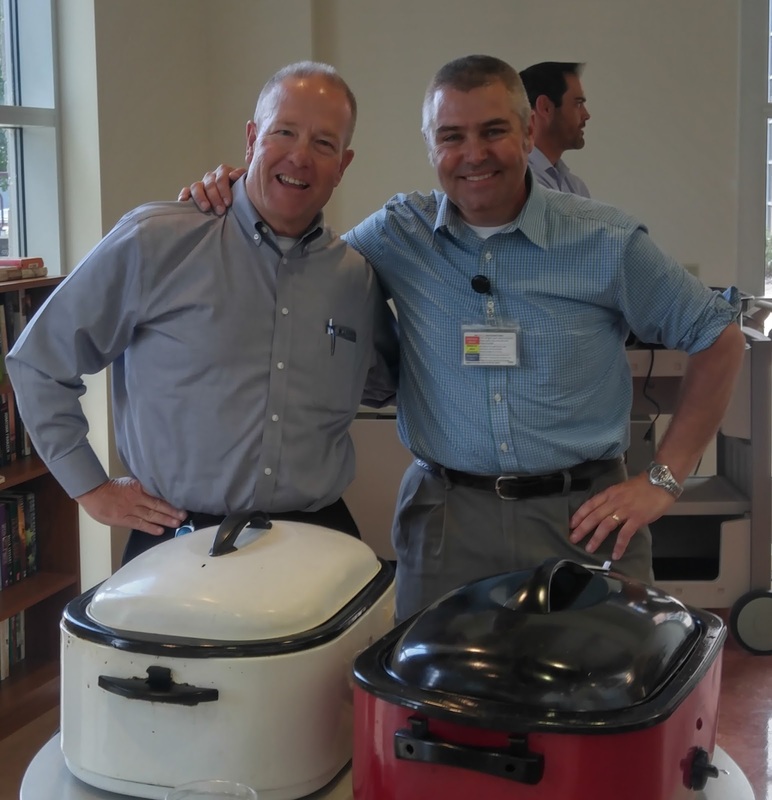 David Petrie grills burgers and ribs for the Mesa County Solid Waste Management staff. Mesa County Solid Waste Management staff take a short break from work to enjoy a meal at the employee appreciation lunch. 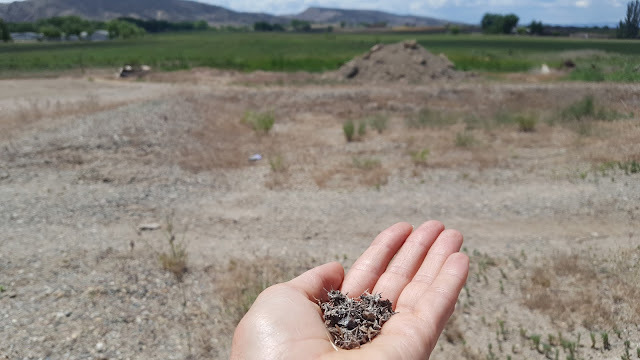 In January of 2016, Mesa County landfill started operating with its own staff rather than continuing to outsource, a move that proved beneficial. In doing so, the cost to operate the landfill has dropped approximately by $900k. Most of the savings will go into funds to find a new landfill site and to ensure that the existing one will be monitored when it closes. Hazardous Material Manager Hope Petrie helps set up the food at the solid waste management employee luncheon. Mesa County Solid Waste Management Director Barrett Jensen, right, thanks his staff for all their hard work and dedication.The cost to operate the landfill went from approximately $3,456,615 to $2,556,816 by managing the operation in-house. Mesa County Solid Waste Management staff members Jim, left, and Lee plate their food. When the chef, David Petrie, asked how the burgers and ribs turned out the crew gave him the thumbs up. Mesa County GIS Administrators Chris Kadel and Ryan Davidson share with the Inside Mesa County class participants how Mesa County develops and maintains its geographic information system. Happy National Doughnut Day! 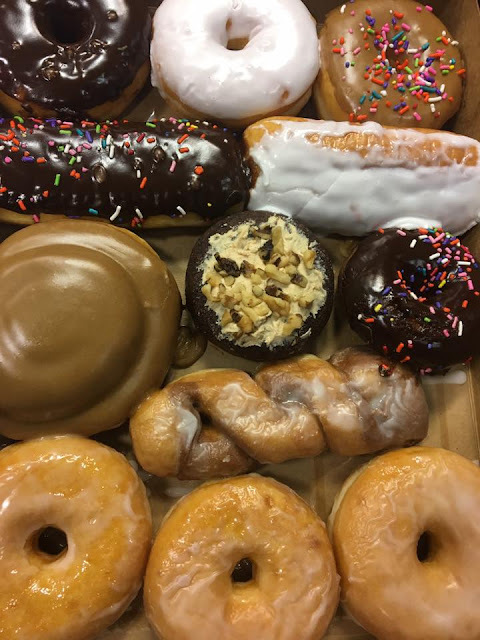 Today, the Mesa County Sheriff's Office sold doughnuts to help raise funds for the Victim Advocate Program (VAP), a program that assists victims, and their families and friends following a traumatic incident or crime. They raised $1,400 and sold out! Here is the list of construction work planned for the week of June 5, road delays should be expected. The schedule is subject to change due to weather conditions. Admission is free! 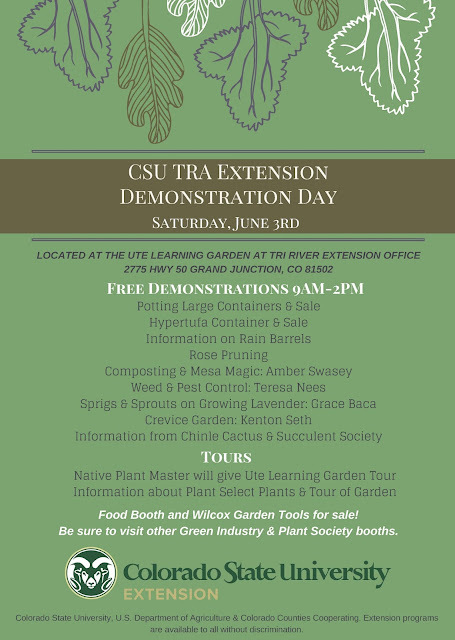 Join them on Saturday, June 3, from 9 a.m. to 2 p.m., behind the CSU Extension Mesa County office, 2775 Hwy 50, for gardening demonstrations and much more. Plus a surprise guest the kids will love! Master Gardeners will have snacks and garden items available for support of their program. Take the family, friends and neighbors for this fun educational event! 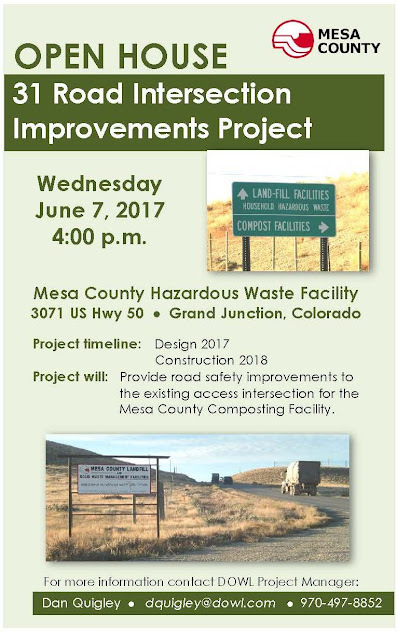 Members of the design team from Mesa County and DOWL will be present to discuss the upcoming road safety improvement project. Community members are encouraged to attend and offer suggestions. What: Open house and short presentation on the 31 Road Intersection Improvement Project. When: Wednesday, June 7, 4 p.m.
Where: Mesa County Hazardous Waste Facility, 3071 US Highway 50.
Who: All community members interested in hearing more about the proposed design and construction schedule for the upcoming road improvement project. 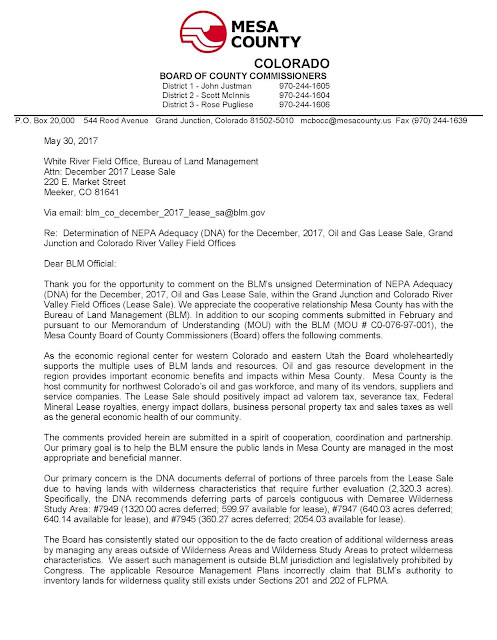 The Board of Mesa County Commissioners this morning signed a letter to the Bureau of Land Management (BLM), regarding the BLM's proposal to offer 28 parcels totaling about 27,280 acres of federal minerals in northwestern Colorado in the December 2017 competitive oil and gas lease sale. The proposal includes 22,308 acres in various locations in Mesa County. 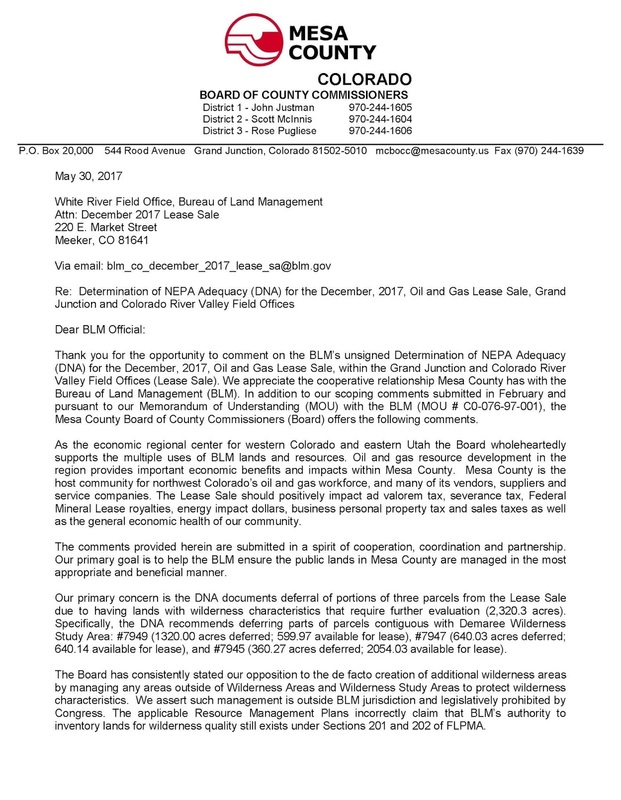 The letter states: "As the economic regional center for western Colorado and eastern Utah the Board wholeheartedly supports the multiple uses of BLM lands and resources. 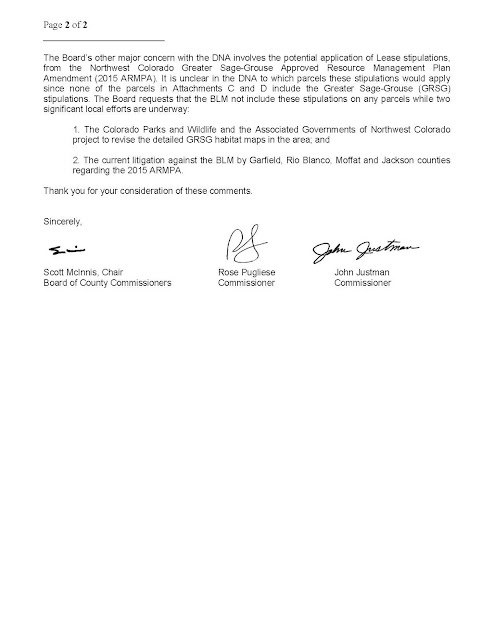 Oil and gas resource development in the region provides important economic benefits and impacts within Mesa County. Mesa County is the host community for northwest Colorado’s oil and gas work force, and many of its vendors, suppliers and service companies. 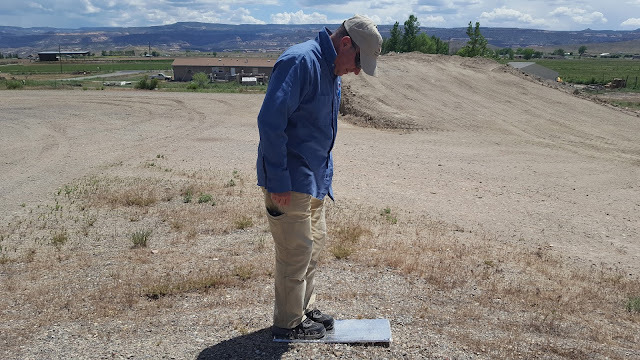 The Lease Sale should positively impact ad valorem tax, severance tax, Federal Mineral Lease royalties, energy impact dollars, business personal property tax and sales taxes as well as the general economic health of our community."